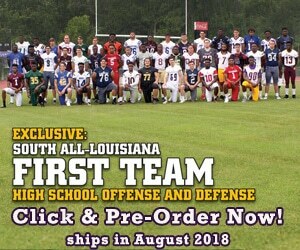 My name is Malachi Dupre, and I played WR for John Curtis Christian High School. I am now signed to play with Louisiana State University. LAFM: How does it feel to be a 3 time State Champion? Even though you were injured for the championship, how was it this year? It feels really good. It shows all of the hard work that the team and I put in these last few years. It shows how well we are coached, and how great the coaching staff is at John Curtis. You know this year I was not able to play in the championship game due to injury. We still won and that is all that matters. Honestly, I could not have been happier even if I had played. I was really proud of the team and just happy to win the game. LAFM: John Curtis has a great history and a great tradition when it comes to their football program. Talk about what it is like and how it feels to play for such a great school? It is something special. There is a lot of tradition that we carry on our shoulders. Honestly, it brings out the best in our players. You know at John Curtis that you are getting coached to the best you can possibly be. It is a great feeling as a team to go into a game confident you are going to get a victory. We go into every game never worrying about losing. Our past success and hard work (we put that hard work in every single day) makes us confident of winning our next game. LAFM: When did you first get in touch with the LSU? Who contacted you? LSU first got in touch with me right after my sophomore year. Coach Frank (Wilson) and Coach (Adam) Henry contacted me. LAFM: Why did you choose LSU? At the end of the day, I think I had it narrowed down to UCLA, Florida State, and LSU. Now that was at the back end of the process. I had many schools that I considered. Those three schools all had similar things that I was looking for in my future college. All of the schools that recruited me had great coaching staffs. I just felt more comfortable with those top 3. I decided on LSU. I have many friends there, it is close to home, and my family will be able to see me more. Those were really the only things that outweighed the other schools. At the end of the day, my friends are here, my family is here, and LSU is my home. LAFM: What do you bring as a player to the Tigers Football Program? I just feel like I bring another threat to our offense. The offense lost a lot of starters to the draft: RB, WR, OL. Our offense could use another weapon, and I feel like I can be one. I am a down field threat, but I really feel like I am a WR who can do it all as well. It is hard to say just one thing. Honestly, the most talent I have ever played with was at the Under Armour game. I think that was our first taste of what college football is going to be like. Unfortunately, I was not able to go 100 %. My hamstring was partially hurt so I never went more than about 80 %. Something we all had to get adjusted to was the game speed and the level of talent surrounding us. It is going to be very similar in college. I have talked to players in college, and they have told me that is what college ball is like. The only difference is that the people you are playing have more experience. I think that no one can ever be too smart, so I definitely want to work on the mental aspect of the game. I need to get bigger. I am 195 ( lbs) right now, so I am still pretty slim. I want to get to 200-205 (lbs) by the time season starts. LAFM: What advice would you give the 2015 class on how they should approach the recruiting process? If you are fortunate enough to have a broad list of schools after you, do not wait till the very end to narrow things down. I narrowed it down which helped me make a decision. I know a lot of guys who left it open till the last few months where they had 10 schools to choose from. I would say get it at least narrowed down to a top 5 of the schools where you think you can fit in and where you feel comfortable. Looking back at the whole ordeal, I was recruited really early in my high school career. It felt like signing day would never come. In the last 2 months it hit me like Wow! I have to make a decision in 2 months. In no time at all it was 2 weeks and then 2 days. It happened so quick at the end. Basically, start getting an idea of where you want to go early. Have an idea of what kind of school you are looking for and try to narrow them down. Do not try and figure out the entire thing at the last minute. As far as picking schools, I think everyone picks their school for a different reason. Go where you want to go and where you are comfortable. LAFM: What are your personal goals for next year? I want my team to be successful, and I want to help my team win. I want to have a 1000 yards, over 50 reception, and be an All-American (at the least a Freshman All-American). I know those are lofty goals. I feel like those are the things I have to do to help my team win. I do not want those things from a selfish standpoint. I want a lot of yards and a lot of catches in order to help my team win games.